Bai Chay Bridge is located on Highway 18 and connects 2 economic – cultural centers of Quang Ninh province, namely Bai Chay and Hon Gai. The bridge is located on Halong Bay with the beautiful and modern architecture, which has significantly contributed to adorn the landscapes of world natural heritage and Halong tourist city. As one of the most famous bridges in Quang Ninh province and Vietnam bridges, Bai Chay Bridge is a national key project with a strategic location on transportation, economy and defense. The presence of Bai Chay Bridge will certainly bring new wind for Halong travel in particular and Quang Ninh tourism in general creating powerful attraction and attracting tourists both at home and abroad. The journey of discovering Halong tourism will thus be definitely much more convenient. 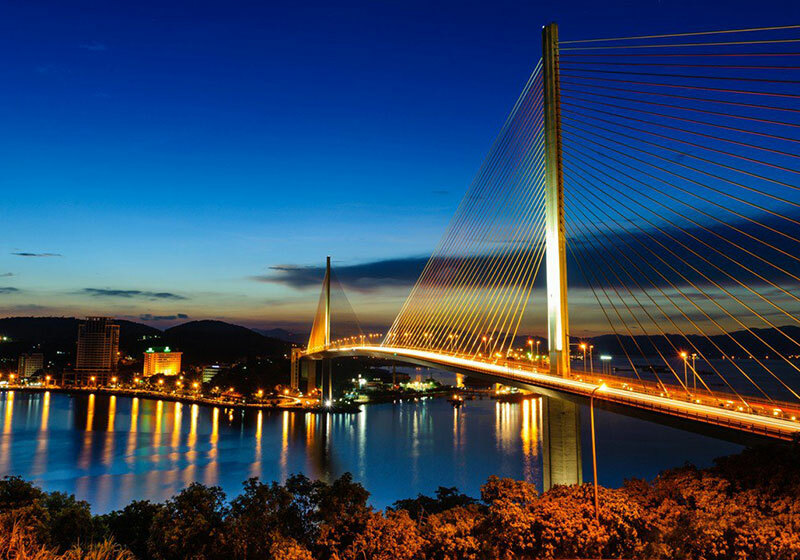 Short Description: The Bãi Cháy Bridge is a cable-stayed bridge on Highway 18, connecting Hồng Gai with Bãi Cháy over the Cửa Lục Straits, separating Cửa Lục Bay with Hạ Long Bay, the territory of Quảng Ninh Province, Vietnam.